Iraq - Cradle of Civilisation Winter 2020 | Untamed Borders - Adventure travel..
A 9-day trip into the heartland of Iraq. Travelling the region bounded by the Euphrates and Tigris rivers, from the capital Baghdad to Basra on the Gulf coast. Tracing back through history, we will travel to the home of some of the first civilisations, visiting the ancient Sumerian sites of Uruk, ancient Babylon and the riches held at the National Museum of Iraq in Baghdad. Starting in Baghdad we will see the legacy of Iraq’s place as the centre of Islamic architecture through visits to Samarra a UNESCO world heritage site with an iconic spiral minaret and the arch of Ctesiphon. We will explore modern Iraq by mingling with the pilgrims in Karbala and Najaf, the two holy places of Shia Islam as well as visiting some of Saddam Hussein’s old palaces. Finally, we will explore Iraq’s marshlands on a boat trip to the point where the two great rivers of antiquity join to create the Shat Al Arab waterway. If there is time we will visit some places of interest in the capital. Day trip to Samarra to visit the archeological site, a UNESCO world heritage site and former Abbasid capital. This includes the 8th century great mosque and the iconic spiral minaret. 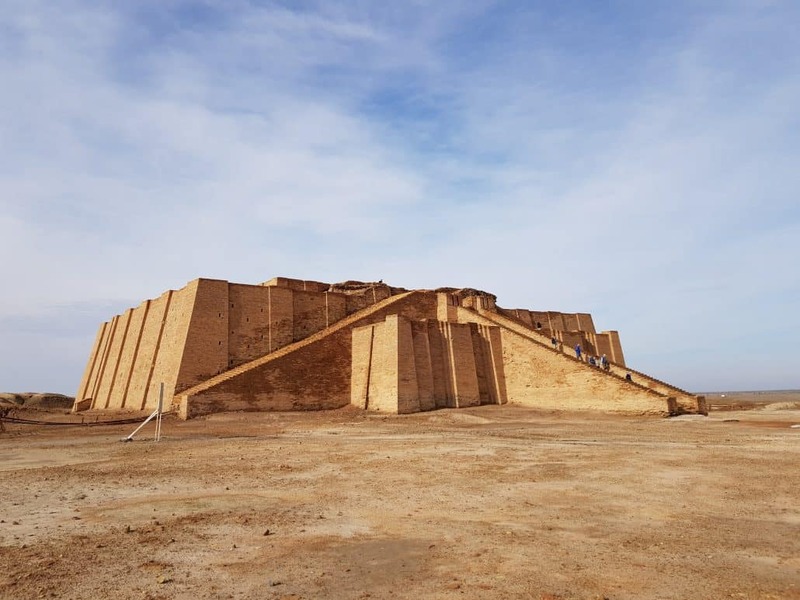 Return to Baghdad via the Babylonian era Ziggurat at Agar Gouf. Visit the Iraq Museum and the Al-Shaheed monument. Travel from Baghdad to Karbala. En route visit the arch of Ctesiphon and remains of the city of Babylon, now heavily reconstructed. At Babylon we will also visit an old palace of Saddam’s. Once in Karbala we can visit the shrine of Imam Hussein. An early start to visit At Tar Caves and Al Ukhaidir Fort. Then travel on to visit Al Khifal and it’s ancient souk then finishing in Kufa and Najaf. You will be able to witness some of the holiest places in Shia Islam including the house of Imam Ali in Kufa and his Shrine in Najaf. Visit the remains of the ancient cities of Uruk and Ur. A day experiencing life in the marshes of Iraq. We will take small boats through the marshes seeing water buffalo and lunching on Masgouf (Iraqi carp – the national dish). We will also visit Qurna and again take to the water to see the point where the Tigris and Euphrates meet to form the Shatt al Arab waterway. A full day in and around Basra including seeing the traditional merchant houses of the city, another boat ride to visit one of Saddam’s old palaces. Transfer to airport in Basra. Single supplement is optional and is an additional US$750 per person. We do not directly arrange international flights to Iraq. We can suggest routes and operators. Iraq visa is required. We will provide visa support for you to obtain this. We provide breakfast. The guide will assist in finding good lunch and dinner options. The accommodation will be based on 2 people sharing a twin room. You will be accompanied by an international guide from Untamed Borders along with a local English speaking guide/fixer for the length of the trip. Trips to Iraq do create dangers of their own and whilst we want you to have as much freedom as possible we must state that the guide has the final word with regards to changes in the itinerary for safety reasons. Whilst the route we have chosen passes through areas which we consider to be relatively stable things can change and we may have to alter the route or cancel sections of the trip at short notice.